Kod*lab’s Anna Brill, is featured on technical.ly. Anna took a year off from research with Kod*lab to be a Robot Technician for the Museum of Science & Industry, Chicago’s Robot Revolution. Robot Revolution, is a groundbreaking exhibition, that debuts in Philadelphia at The Franklin Institute, Saturday, October 8, 2016. See a collection of 40 cutting-edge robots from around the world, including RHex and RISE. There are lots of interactive, hands on activities to engage with the robots. One can even operate RHex. Ghost Robotics, a spin-off company cofounded by lab PhD students Avik De and Gavin Kenneally released their first video officially introducing Ghost Minitaur to the world. As part of our outreach efforts to support and encourage youth interested in STEM and robotics, Kod*lab judged FLL Qualifying Tournament at Central High School earlier in 2016. Next, we are looking forward to participating in the opening day events of Robot Revolution at the Franklin Institute on October 8th. More soon! GRASP’s Research Experience for Teachers (RET) for Middle School Teachers is featured on Technical.ly Kod*lab is one of three labs hosting teachers. The project is supported by NSF Award #1542301. Video Friday: What Happens in Kod*lab? Kod*lab is featured on IEEE “Video Friday:What Happens in Kod*lab?”. Undergraduates working in Kod*lab are important to the lab’s success in building robots and advancing research. The students’ experiences have often led to undergraduate-authored refereed publications and exciting careers in robotics. 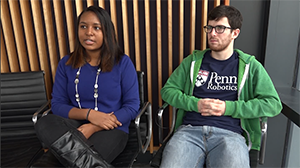 Kod*lab’s recent undergraduate research assistants, Shafag Idris ’15, Electrical and Systems Engineering, and Justin Starr ’15, Mechanical Engineering and Applied Mechanics, share their experiences and insight while working in Kod*lab and post-graduation plans. 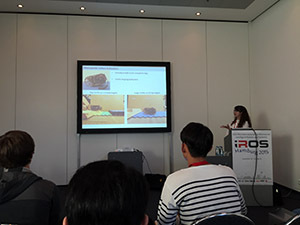 Anna Brill presented the paper “Tail-Assisted Rigid and Compliant Legged Leaping” at the International Conference on Intelligent Robots and Systems (IROS2015) in Hamburg, Germany in September 2015. Anna was an undergraduate researcher with Kodlab 2013 – 2015 and is currently on leave at the Museum of Science and Industry for the Robot Revolution exhibition where she is one of three robot specialists. The Jerboa is a 12DOF, passive-compliant legged, tailed biped actuated by four brushless DC motors. We anticipate that this robot will be capable of executing a broad range of locomotion tasks including sitting, standing, walking, hopping, running, turning, leaping, and more. 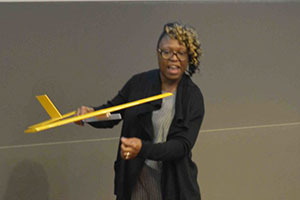 The first behavior we are researching is tail-energized planar hopping, which showcases a novel use for a robotic tail. The attached video describes how the control strategy is developed as a parallel composition of decoupled templates. Omur Arslan presented the paper “A Recursive, Distributed Minimum Spanning Tree Algorithm for Mobile Ad Hoc Networks” at 2014 Robotics: Science and Systems Conference (RSS2014), CarNet Workshop, in Berkeley, California and paper “Navigation of Distinct Euclidean Particles via Hierarchical Clustering” at International Workshop on the Algorithmic Foundations of Robotics 2014 (WAFR2014) in Istanbul, Turkey. KodLab on IEEE Spectrum’s Video Friday two weeks in a row! Video documentation from KodLab’s research trip with RHexand collaborators from USDA Agricultural Research Serviceand University of Nevada Desert Research Institute to the Jornada and White Sands deserts in November and our trip to the Recycled Artist-in-Residence RAIR on November 21st made appearances on IEEE Spectrum’s Video Friday, a weekly blog of videos of robotics, on 11/21/14 and 12/5/14respectively. Tobi (Teaching Oriented Bio-Inspired) robot is a friendly walking robot with four legs developed at Kodlab. On Wednesday, October 15thThe DM&D is hosting a workshop where you get to use Tobi to create a physically-programmed piece of performance art or tell a story. Come find out where art meets robotics! Space is limited. Kod*lab has seven undergraduates working as research assistants in the lab this summer – Shafag Idris, Ahmed Zahra, Anna Brill Ben Kramer, Mitch Folgelson, Jordan Martin, and REUs (Research Experiences for Undergraduates) Jordan White and Aaron Effron. They are all paired with a PhD student for a mentor to work on research projects and are all keeping weekly research journals on our wiki. To see some of the cool stuff they doing, check out Kodlab’s Tumblr. Avik De presented the paper “Active Sensing for Dynamic, Non-holonomic, Robust Visual Servoing” at ICRA 2014 in Hong Kong and the paper “Planar Hopping with a Leg and a Tail” at Dynamic Walking in Zurich. Gavin Kenneally also presented a paper “Kinematic Leg Design for an Electromechanical Robot” at ICRA 2014. Jeff Duperret presented the paper “Towards a Comparative Measure for Legged Agility” at ISER 2014, in Marrakesh, Morocco. Sonia Roberts (doctoral program, 2nd year), Anna Brill (undergrad, ‘16), and Kevin Alcedo (undergrad, ‘15) traveled with three robots to the Museum of Science and Industry in Chicago to celebrate National Robotics Week at their Robot Block Party and announce our involvement with a new Museum exhibit, Robot Revolutions. Two copies of RHex, the Parkour robot, demonstrated how great six c-shaped legs are for going over all kinds of terrain, while TRHex (Teaching RHex), the new educational robot hexapod currently being developed by master’s student Emily Plumb (‘14) as part of the Y-Prize challenge (and now at the time of posting the winner of the 2013–14 Y-Prize Competition!) let kids try out their own gaits on a smaller, friendlier robot. We had a lot of fun and look forward to coming back to Chicago soon! Daniel Koditschek, Vijay Kumar, Stefano Soatto and Avik De are organizing a full day workshop, “Opportunities and Challenges of Joint Inference and Control in Mobile Robotics” Saturday, May 31, 2014 (9:00–17:30) at ICRA 2014which will be held at the Hong Kong Convention and Exhibition Centre. 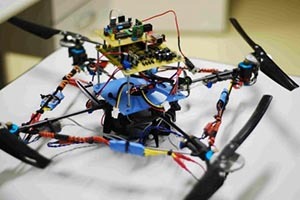 Contestants will be able to devise applications centered on three types of robots, including Koditschek’s ground-based robot, X-RHex, a six-legged platform inspired by cockroaches’ ability to quickly cross difficult terrain. X-RHex is able to carry and use a wide variety of sensors and actuators to complement its outstanding off-road mobility. More about the Y-Prize Competition. Join the competition! More interest in RHex with an Associated Press article and video on RHex, including interviews with both Aaron Johnson and Prof. Koditschek, as well as a WSJ interview. A new video, article, and interview show off the robot’s parkour-like jumps, leaps, and flips, now taken out of the labortory and in stunning HD. A version of this video was presented at Dynamic Walking 2013. Two papers were presented at ICRA 2013, the first by Avik De on dynamic sensor management, and the second by Aaron Johnson on leaping with RHex for which Aaron was a finalist for Best Student Paper! Temple University biologist Tonia Hsieh explains how she uses the unlikely combination of lizards and high speed cameras to advance the field of robotics. The video features some gorgeous shots of XRL. Kod*lab participated in the Y-Prize idea generation event. The goal of this competition is to use existing robotics technology developed at Penn in creative, new, and unexpected applications. At the event, XRL was shown off with other robots from GRASP by being used as a mobile quadrotor dock. A new tail for XRL was introduced at CLAWAR 2012, and the paper was a finalist for best student paper! This paper was part of a special session hosted by Kod*lab entitled Throwing Your Weight Around: Using Appendage Inertia. Two new robots, XRL and Canid, were introduced at the SPIE Defense, Security, and Sensing Conference in Baltimore, MD. 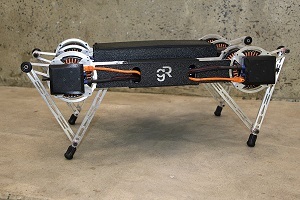 XRL is a lighter version of X-RHex designed to be highly agile, and Canid is a quadruped with an actively controlled compliant spine. Deniz, Avik, Justin and Jorge attended the First Lego League robotics competition for middle schoolers and demo-ed the X-RHex robots to attendees. Aaron Johnson presented a paper at the IEEE International Symposium on Safety, Security, and Rescue Robotics (SSRR2011) on Hill and Stair Climbing in Kyoto, Japan. Matt Hale and Tim Hennelley have added an Xbox Kinect to X-RHex to make what they call “RHex Box” as a class project. Check out a video of person following and their website. Avik De, Goran Lynch, and Aaron Johnson presented a paper at the IEEE International Conference on Technologies for Practical Robot Applications (TePRA2011) on Motor Selection in Woburn, MA. In December, Clark Haynes presented a paper, On the Comparative Analysis of Locomotory Systems with Vertical Travel, at the International Symposium on Experimental Robotics in Delhia, India. Aaron Johnson and Clark Haynes presented a paper at the IEEE Intelligent Robots and Systems (IROS2010) on Disurbance Detection, Identification, and Recovery in Taipei, Taiwan. Goran Lynch made a sacrifice in the name of academic research and travelled to the first International Conference on Applied Bionics and Biomechanics in Venice, Italy, to present recent research (and on scholarly commons) in collaboration with biology professor Larry Rome on the effects of sprawl angle on vertical climbing. Kod*lab would like to welcome our newest grad student, Avik De! RHex once again made a trip to the desert to test its unique style of locomotion. 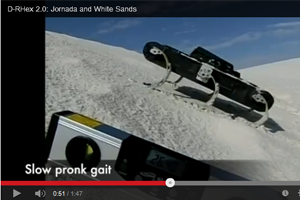 Through automated tuning algorithms, the robot learned new efficient gaits for sandy and rocky terrains, much like its cousin, SandBot. A video of the robot in action can be found here. Two members of Kod*lab, Deniz Ilhan and Goran Lynch, traveled to Annapolis, Maryland to promote biologically inspired robotics at an Entomological Society of America event. 450 guests of all ages were well entertained, and, we hope, inspired. Click here to see pictures. Kod*lab would like to welcome Aaron Peck as a visiting scholar for the spring semester! Kod*lab is pleased to introduce our newest robot, X-RHex! With many improvements over past versions of RHex, X-RHex has already been used in the lab for several months, and has even proven itself in the Mojave Desert. It can also use a variety of modular payloads to add new sensor or other capabilities. You can read more about X-RHex here, or watch the YouTube video here. Kod*lab was very active this summer, with a total of 7 undergraduates contributing to our research on a variety of topics. Each has written up an end of summer report, and you can read them here: Ani, Ben, Derek, Matt, Phillip, Ryan, Sarah. Congratulations everyone on a productive summer! We will be presenting our paper, A Self-Exciting Controller for High-Speed Vertical Running, at IROS 2009. The conference runs from October 11–15, 2009, in St. Louis, MO. We will be presenting new work on the topology and control of legged gaits in our paper, Gait Transitions for Quasi-Static Hexapedal Locomotion on Level Ground, at ISRR 2009 in Lucerne, Switzerland, on August 31, 2009. The RHex robot recently completed a trip to the desert southwest to evaluate the use of legged robots in adverse terrains. Kodlab members outfitted a Research RHex robot with a newly designed carbon fiber shell and white coating to deal with heat, dust, and rocky terrain encountered. Read more about Desert RHex. Goran Lynch, Ph.D. student in Kodlab, has been awarded a “Penn Prize for Excellence in Teaching by Graduate Students”, awarded in a reception on April 28th. Congratulations! We will be presenting our paper, Rapid Pole Climbing with a Quadrupedal Robot, a joint effort with Boston Dynamics, at ICRA 2009 in Kobe, Japan, on May 15, 2009. SandBot, our hexapedal platform to study locomotion in sand (with colleagues at Georgia Tech), appears as the cover story of this month’s IEEE Spectrum (local copy).